Designed for skid steers, the LPTG series tine grapple easily moves rocks, brush, wood, metal and other materials while leaving the dirt on the ground. The grapple is ideal for various applications including construction site demolition and clean-up, storm clean-up, and landscaping. 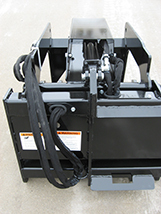 Features include 5-½” tine spacing, 3,000 psi cylinders with cylinder guards to protect the cylinders and components. Hoses are routed through the tube to provide hose protection. In addition hose routing down the left hand back of the bucket results in maximum dump and roll back as optimum hose length is maintained. Flat-face couplers are standard. 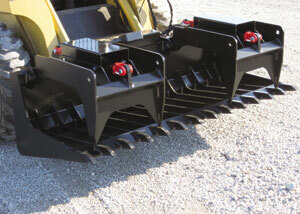 Features include 5-1/2" tine spacing and 3,000 psi cylinders with cylinder guards. Hoses routed through upper tube.